One of the cool things coming with Obeo Designer 6.0 is the new "Ecore Modeling Project" creation wizard. 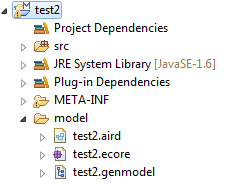 It automatically creates an EMF project containing an Ecore model and its corresponding genmodel. This project is also created with the Modeling Project nature and a Obeo Designer representation file (.aird) containing a diagram (depending on the viewpoint selected with the wizard). 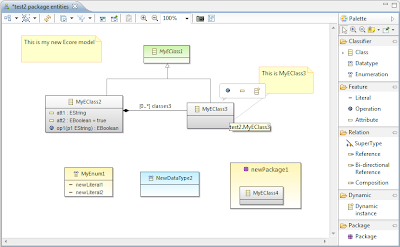 This diagram is automatically opened and you can directly start graphically design your Domain Model. Once you have defined your packages, classes, attributes, relations, ... you just have to open the genmodel and generate the EMF code. Of course you can customize the genmodel to introduce your own generation choices. This video demonstrates this new wizard on a simple Ecore model.